Both CoffeeRoaster and FishWare perform most of their processing on the local computer, as opposed to a Client/Server based system. When large data quantities are involved, the necessary data first needs to be retrieved from the data source which may be the local computer or a networked computer. After the data has been retrieved, it must be processed by CoffeeRoaster or FishWare. 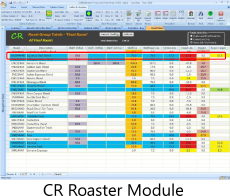 In addition to running CoffeeRoaster or FishWare, most customers are generally multitasking running QuickBooks, Outlook/Mail and other applications simultaneously with CoffeeRoaser or FishWare. For these reasons, it is recommended that you invest in quality hardware to meet your speed expectations. 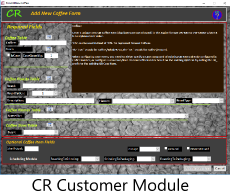 For Operating Systems, CoffeeRoaster and FishWare have been run on all Microsoft Client Operating Systems from Windows XP to the current Windows 10 Pro including both 32 and 64 bit versions of these operating systems. Both have also been successfully installed on several Windows Server Operating Systems beginning with Windows Server 2003. For Operating Systems, 64 Bit Operating Systems with 6G or more memory are much preferred vs 32 Bit Operating Systems because of their ability to address memory beyond 4G. Windows 32 Bit Operating Systems and 32 Bit applications are not able to utilize memory above 4G. 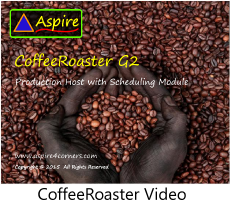 CoffeeRoaster and FishWare are 32 bit applications as is most other software that you are running. 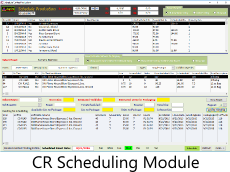 On a 64 Bit Operating System 32 bit software applications like QuickBooks, CoffeeRoaster and FishWare are limited to run in the first 4G of memory space. By having a 64 Bit Operating System with more than 4G of memory (6G or more), some of the operating system can be moved to the 64 bit space above 4G allowing more memory for the 32 bit applications in the 4G space. Aspire recommends 64 bit operating systems because of their ability to manage memory beyond the 4G limit for 32 bit operating systems. Aspire recommends Intel Core 7 or better Processors for all situations where computer speed is important. Intel Processors can support multiple 'cores', in general, the more cores a processor has the greater its relative performance. A 'Quad Core' processor is generally faster than a 'Dual Core' or single core processor and is recommended when performance is important. Processors are also rated on their 'speed'. In general, 3.0 Ghz or higher is recommended. Turbo Burst is a processor technology that can increase processor speed when more speed is required. Hyper-Threading is another processor technology that can be confusing. Essentially this technology is viewed by the Windows Operating Systems as creating additional 'Virtual' processors allowing some applications to run faster. Processors have a small amount of on board memory called 'cache'. This memory is expensive but fast, it enables the processor to get memory items faster than it is possible from the normal System RAM. Cache directly impacts the cost of the processor due to the higher cost of the on board memory. The processors listed below are two processors that I have used successfully in developing CoffeeRoaster and FishWare. For 32 Bit Operating Systems a minimun of 4G of RAM is recommended but additional RAM will not be able to be used by a 32 Bit Operating System or applications. For 64 Bit Operating Systems, a minimum of 6G of RAM is recommended, 8G is better. Almost all desktop applications are written as 32 Bit applications, that means that they are only able to access memory below 4G. On a desktop with a 64 Bit operating system and 32 Bit applications with 4G or less of RAM, both the operating system and the applications are sharing the same 4G memory space. When RAM is increased beyond 4G with a 64 Bit operating system, the operating system can expand into the memory space beyone 4G while the 32 Bit applications will still be required to run in the 4G space. By allowing the Operating System to expand beyond the 4G 32 Bit space, the computer will run faster. 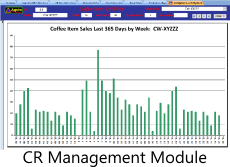 In the early years of CoffeeRoaster a monitor of 1024w x 768h was considered sufficient. As improvements have been made to CoffeeRoaster and FishWare there has been a need to increase the size of the display. To display CoffeeRoaster and FishWare today a 1920w x 1080h display is recommended. Monitors are also measured for 'size' by their diagonal measurement, in general 21" or larger monitors are best. The 1920w x 1080h refers to the number of 'pixels' that can be displayed in terms of width and height. 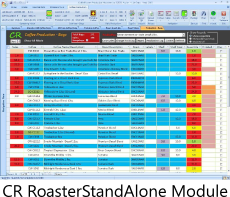 For FishWare where it is desireable to manage both an Accounting application such as QuickBooks and FishWare calendars at the same time, dual sided by side monitors are recommended. There are new technologies for Hard Drives in recent years which have the ability to increase the overall speed of the computer. Some Solid State Hard Drives (SSD) store data in a form of memory which can be accessed much faster than conventional mechanical hard drives which store data on spinning platters. Some higher end computers offfer SSD or Hybrid SSD/Traditional drives which can improve overall computer performance. With both CoffeeRoaster and FishWare you should dedicate some hard drive space for backup. These backups should be stored on a different hard drive than the original data source so that a single hard drive failure will be less of a diasaster. Aspire recommends that additional hard drives be mounted inside the computer case, but this is not always possible with modern computers. If you are unable to add a second driver internally to your computer then consider an external USB Hard Drive for backup.